Macmillan Learning and WebAssign have partnered to deliver WebAssign Premium – a comprehensive and flexible suite of resources for your calculus course. Combining the most widely used online homework platform with authoritative textbook content and Macmillan’s esteemed Calctools, WebAssign Premium extends and enhances the classroom experience for instructors and students. 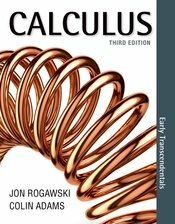 "It's an invitation to learn calculus the right way."